YWAM | My Journeys Through Life . . . Herding Cats In New Mexico! 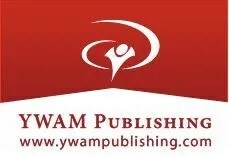 We have been very fortunate to have been chosen as reviewers for YWAM Publishing (Youth With A Mission) before during the years I have been a member of the Homeschool Review Crew. This year, we were so lucky to receive my very first choice, Ben Carson, A Chance At Life, along with the accompanying study guide. There is a reason I really wanted this particular title to review with my boys. As you know, we have built our family by way of adoption. Two of our boys, “Mr. Loquacious” and his twin “The Puzzler” are biracial. It is so very important to me that as they are getting older (they just turned 16, which is so hard to believe!) they learn that it is not true that the only path for them is to follow the street crowd. One of the boys has had some problems which stem from his early life, and had been headed down the path of thinking the best thing was to look like, talk like, and act like a “gangsta.” He’s been working hard at moving back into the correct direction, but this story showed him and my other boys that eve coming from poverty and a hard life, one can go so far, if they work at it! 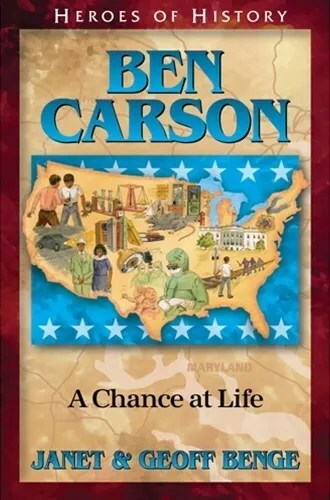 This book doesn’t actually open with the early days of Ben Carson’s life. The very first little (two page) chapter, more of a prologue, really, shows us Ben, looking around at all of the famous people sitting with him at the 1994 Essence Awards at the Paramount Theatre in New York City. He was there, being honored as one of the African-Americans who have made significant contributions in each of their fields. Here are my twins reading the book together. At that time, Ben, his mother Sonya and his brother Curtis lived in Detroit. It was not easy to be a single mother in the 1950’s. Sonya Carson went to work as a domestic servant, working two, and sometimes three jobs at a time to try and make ends meet. At some point during that time, his mother began going to church, as did her son’s. There came a Sunday when the message so moved Ben and his brother Curtis, that they both went forward to commit their lives to Jesus. It was then that Ben told his mother he wanted to be a doctor, having heard such a message about missionary doctors. Ben’s family moved to Boston for a while to live with relatives. Unfortunately, he did very poorly in school, failing almost all assignments. Eventually, the school did vision tests on the students and discovered that Ben could barely see anything on the chart! His mother took him to an eye doctor, and when he came back to school with his new glasses, he was astounded at what he could see written on the board, that he had never even known was there! But Ben was still not doing very well in school, so his mother told him and his brother she was going to pray on what she could best do to help them. Mrs. Carson prayed, alright, and then she came home from one of her jobs and snapped off the TV! She told them that from now on, they could have two programs a week and that was it. She told them from this point on, instead of coming home from school to watch TV, they had to get to the library and check out at least two books. Each week, they were to read both books and write a report on each one. Ben soon realized his mother was right, and it was not impossible to do this. He didn’t know it at the time, he never knew until many years later, his mother couldn’t read or write. she wanted so much more for her boys. Later, in junior high school during the early sixties, he discovered how much racial strife was erupting. He was one of only a few black kids in a mostly white school, and got a lot of threats. His anger kept building and one day, he’d had enough and hit another boy back who started a fight with him. he hurt the boy, because he didn’t remember he still had his locker padlock in his hand. He was ashamed, because he knew a Christian boy shouldn’t do that. But, that wouldn’t be the last time his rage would erupt. It would happen again one day when his mother bought him pants he didn’t like. He said he wouldn’t wear them, and when she said he had to, Ben swung on her, and had to be held back by his brother. Having been through this with one of my twins, I know how very important it is to get the child to turn around in direction. Eventually in high school, Ben was also in JROTC, and working hard to get his life on track. And he did well at it, too. Ben went on to Yale, and did his medical residency at Johns Hopkins. Ben Carson went on to become the first neurosurgeon to successfully separate twins who were joined at the head, having to separate their brain. I’m sorry that this book ends when it does, because I think it’s a really big deal that he has gone from poverty as a child to now being the Secretary of Health and Urban Development. Now, the unit study, as are all of the studies from YWAM Publishing, is really great in that it fleshes out the information in the book. Now, we are still working through this, because it’s so interesting and there is so much available! We have mostly used oral discussion during this study, but are looking forward to going back over this study and going even deeper with it! We had Corrie Ten Boom, Keeper of The Angel’s Den last year, and in 2013, we had George Washington: True Patriot. Having now read three books from YWAM Publishing and used the unit studies, we have become huge fans of this company! So far, we have felt them to be exceptionally good reads, very historically accurate, and accompanied by wonderful study materials to bring them further to life! 100 Homeschool Review Crew Members reviewed YWAM publications, both Heroes of History and Christian Heroes : Then & Now. To read what the other 99 crew members and their children think of the abundant choice of heroes, please click the banner below! For a few weeks now, along with 99 other crew review members, we have been reviewing one of the wonderful YWAM Digital Studies from YWAM Publishing. A little something I had wondered about this company was what, exactly, the initials stand for, so I wet looking on their website. According to the FAQ, YWAM is Youth With A Mission, and these unit studies are from the publishing division of the organization. Having looked at the YWAM site, it looks like a very good organization! My boys and I were fortunate in that we received my very top choice when I applied, and thus, we have been reading the book Corrie Ten Boom, Keeper of The Angel’s Den and using the Digital Unit Study to go along with it. 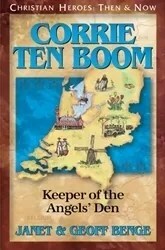 For our review, we were sent the book Corrie Ten Boom as a physical product, and the unit study as a digital product. I remember reading the story of Corrie Ten Boom in the book “The Hiding Place” when I was much younger, and have wanted to introduce her to my own children. I want them to fully understand that no matter how difficult they themselves often find it to choose their faith over fear of anything, whether it be fear of ridicule, fear of violence, or whatever it may be. Corrie Ten Boom is SUCH a wonderful example of this, along with her family! Corrie and her family lived in Holland, in a home above their watch shop. Holland was eventually invaded by the Nazis, Corrie’s family, the Ten booms; began working to help save the lives of Jewish people who were, as we all know now, were in terrible danger. They hid Jewish people in their home, and were part of the underground to help Jews escape the Nazis, and the death camps. The Ten Boom family was eventually caught and arrested. Corrie and her sister were sent to a concentration camp called Ravensbruck, where they were definitely in danger of being killed by being gassed. Corrie’s faith never wavered, though, and through it all, she showed others how to be tankful for even tiny things, such as the tiny fleas which infested the barracks in which she and her sister were held. Because of the fleas, the guards NEVER even stepped foot inside, which allowed the Ten Boom sisters to study their hidden Bible at night. The Digital Unit Studies from YWAM are so good, and work for the different levels of our children. I will tell you, that as we do with many unit studies, we are doing this as a group. Questions are given for each chapter, and we discuss them out loud. This seems to help with learning even more than trying to write everything out, particularly if you have reluctant writers. The questions mentioned above, are always my favorite part when we are studying something, because if a question sparks another question, and another, then so much the better and we’re off on a rabbit trail! 🙂 However, there are geography sections, ideas for social studies, hands on activities, essays, and so on, therefore, there should be something that will work for just about everyone! We like YWAM Unit Studies, and we think you will, too! To read what 99 other crew review members think of this and other YWAM Digital Unit Studies, please click here. I had never had any experience with materials from YWAM Publishing, but when I saw what was being offered as a possible review, I really wanted to give this one a try. I was curious as to what YWAM stood for, and before I had the chance to find out, my husband (who puts all of my review deadlines into my phone calendar with reminders for me) looked it up. YWAM, according to their own website, stands for Youth With A Mission. They are one of the largest Christian charitable organizations in the world. To learn more about them, go here. 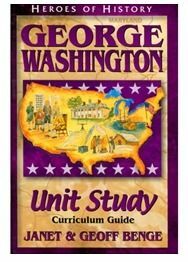 along with the Heroes of History Unit Study Curriculum Guide: George Washington to go with it . . .
After taking a look at the descriptions for both, I decided that George Washington would be the best choice in our family, for a variety of reasons. First, we have been studying early American, and also, because my kids are very interested in the period covered by this book because of some other things they have been doing. I received this book as a pdf download, along with the curriculum unit study guide, which came as two separate pdf downloads. The book is available as a paperback, for the current price of $6.99 (regularly $$8.99), and the curriculum unit study guide for $7.49 (regularly $9.99). 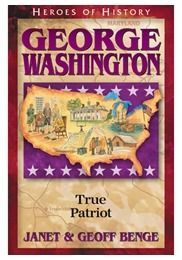 The book HEROES OF HISTORY: George Washington: True Patriot is also available in a Kindle edition, a Nook edition, and as an audiobook edition. You may click here for a sample of the unit study curriculum guide. We received both the book and the curriculum unit study guide in pdf format, and have been using the book as a read-aloud. It is actually amazing to me (though it really ought not to be!) how much even I have been learning (especially about George Washington’s early life) while we have been reading this book together! I have read a great deal of it to my kids, but some of them have taken turns at the reading as well, including my reluctant reader, “Mr. Loquacious”, who actually ASKED to have a turn after listening to “The Puzzler” read for a bit, lol! Here is “Mr. Loquacious” reading a portion from the book . . . Here is “The Puzzler” reading some of the book . . .
Key Quotes (for copy work or memorization), but which WE used orally, to get discussions going. Student Explorations, which included things like essay questions, creative writing, hands on projects, audio/visual projects, and arts & crafts projects. There is also a section called Community Links, with suggestions for field trips and other resources, such as having a guest speaker come into a classroom. Conceptual questions . . . that a teacher (or parent) can use to have their students write a paragraph or two in response to a given question, present an oral report, or discuss the question as a group. There is also an appendix listing many additional books and resources, and an appendix which gives the answers to the chapter questions. We have very much enjoyed reading HEROES OF HISTORY, George Washington: True Patriot, and I believe we would most likely enjoy many other of the books offered by YWAM. I also believe that the price for them is such that they are very affordable to use as read-alouds, and although I am not sure I would use the unit study curriculum other than orally at this point in my children’s lives, I also believe they are a good value for the price. To read what other Schoolhouse Review Crew members thought of George Washington: True Patriot and matching curriculum unit study guide, and of the YWAM book and study guide for Jim Elliot: One Great Purpose book and study guide, please click on the graphic below!